Was Phil Hare being metaphorical? Or was it the Hep-C? Trick question. He's simply a typical Democrat. In an underwater steel cage Texas death match between Hank Johnson and Phil Hare, who wins? Everybody! It's under water! Harry Smith called Bush a Nazi and called for the imprisonment of Rush Limbaugh. I know so, cause I used the CBS fact-checking method. When Harry Smith had his colonoscopy, his doctor missed something: Harry Smith's head. Obama tells critics to "tone down" rhetoric. Or what? Obama: I spent all that money so we wouldn't go bankrupt. Really. Two "suspicious packages" in Atlanta have caused MARTA delays. And not even in Hank Johnson's district. What was in the packages? Hank Johnson's brain. We knew he had one, just not where it was. Activists block whale meat carrying ship. Mmmm... Whale. If you think things wouldn't be any better if John McCain had won the election, you don't grasp the problem. Just in case you weren't clear: 16,500 More Reasons to Vote Republican in November. Unemployment steady at 9.7% Yay! As many people got jobs as lost jobs! Charlie is with the Angel. 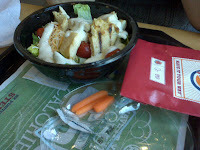 Burger King salad. Some assembly required. Traffic was horrible after work yesterday. And some people were taking their own sweet time making turns. Light would turn green and they'd just sit there. There should be a traffic sign that says "No Fiddle-Farting Around." Yeah, that'd help.